Experimental sigmoid growth curves approaching an asymptotic level have been described by a variety of mathematical expressions having three adjustable parameters. 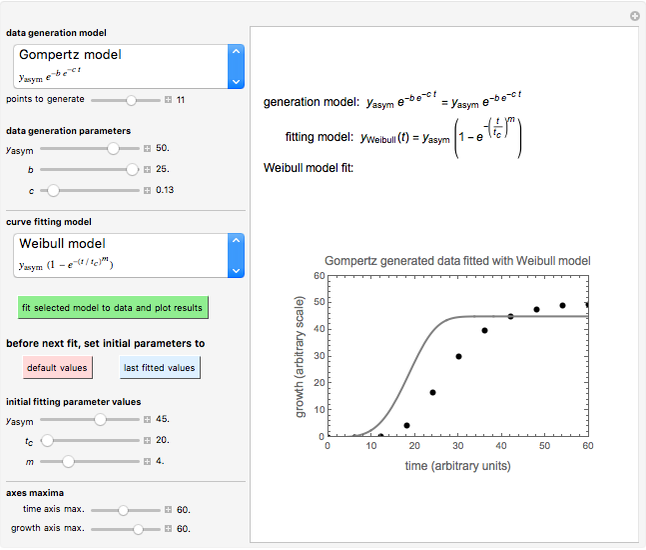 Among them are the Gompertz model, various versions of the logistic equation, and the cumulative form of the Weibull ("stretched exponential") model. Despite their different mathematical formulations, most of these models can be used interchangeably, that is, they have a similar degree of fit as judged by statistical criteria. 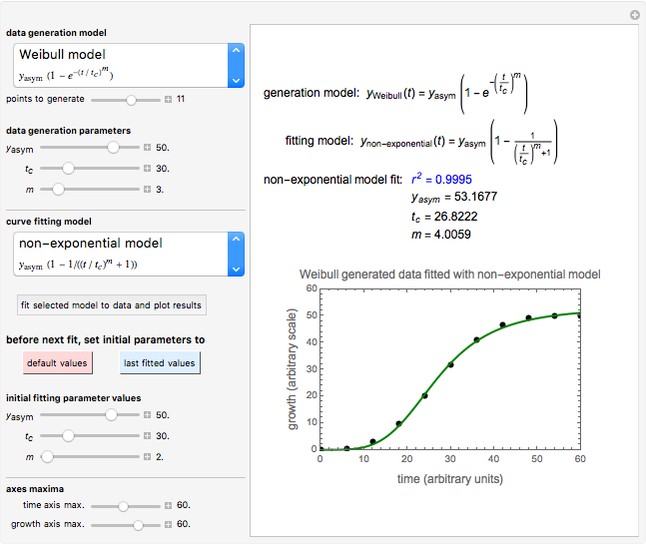 This is demonstrated by allowing the user to generate growth data with any of six growth models and fit the data using nonlinear regression with any of the models for comparison. 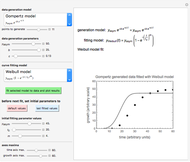 Experimental sigmoid growth curves have been described by a variety of models. 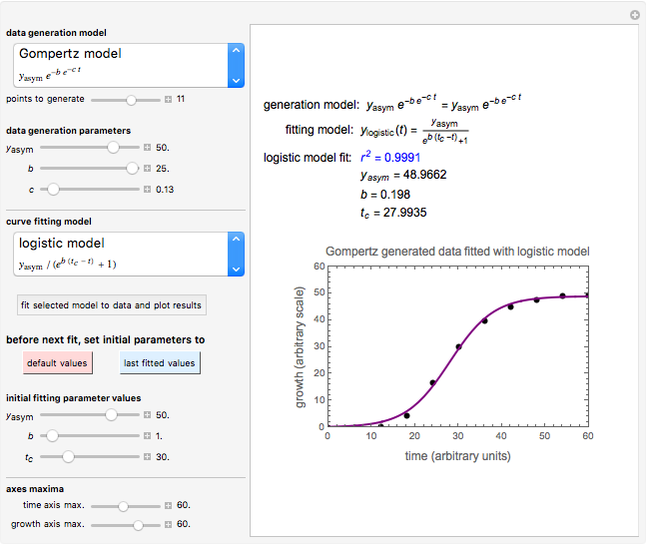 Among them are the Gompertz model , the Weibull or "stretched exponential" model , the non-exponential model , the power model , the logistic model , and the shifted logistic model . In these equations, stands for the linear or logarithmic growth ratio or , respectively, where is the momentary growing entity (e.g., the number of individual organisms), and is the initial number. 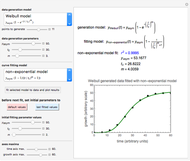 In all these models, is the asymptotic growth level, that is, . The parameters , , , and or their combination account for the growth curve inflection point&CloseCurlyQuote;s location and its slope at this point, which can be considered a growth rate measure. 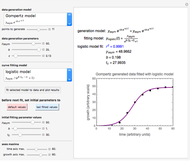 In this Demonstration you can select the generation model, its parameters and the number of points to be generated, and the model to fit the data. Upon clicking the green setter button the program attempts to fit the data with the chosen model, starting with initial parameter values taken from the sliders located below. If the first fit attempt fails, you can use the sliders to modify the parameters' initial estimates (starting with is recommended) until the gray curve roughly matches the generated data points; then you can click the green button to attempt a new fit. If the new fit is still unsatisfactory, you can click the "last fitted values" button to reset the initial parameters to the last fitted values. This procedure can be repeated until a satisfactory fit is obtained. (Note that the best-fitted parameter values after several attempts might be found outside the limits of the initial parameters' sliders, in which case a slider's button will be shadowed in red, as seen in Snapshot 4.) The fitted model&CloseCurlyQuote;s parameters are displayed with the corresponding above the plot of a colored fitted curve superimposed on the generated data. The fitted curve is displayed in a different color for each fitted model. You can modify the plot's axes using the two sliders at the bottom. Notice that the initial values are , , , and by definition, as it should be, while and . This has little effect on the goodness of fit, but can become a serious problem when the Gompertz or logistic model is used for dynamic growth, where the boundary condition is that , that is, . Mark D. Normand and Micha Peleg "Comparison of Six Sigmoid Growth Curve Models"